When you are looking to get your hands on a ukulele, the two most important considerations you will need to make are the sound of the ukulele and the size of the ukulele. Do you want a traditional ukulele sound or a deeper sound? Do you want to learn the ukulele for the purpose of learning the ukulele or you want to learn ukulele first and then transition to the guitar? 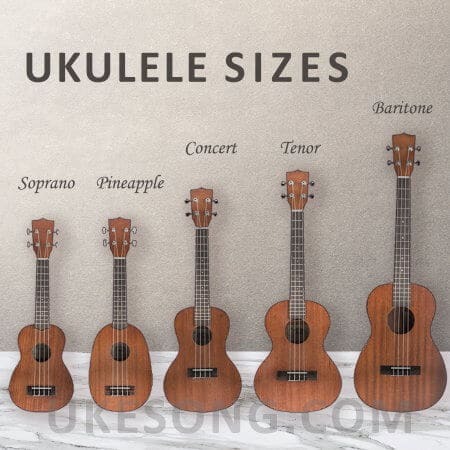 What are the most common ukulele sizes? Elsewhere on this website, I have produced a significant amount of information related to the various ukulele sizes on the market. On this page, I am going to keep it brief. I am just going to give you an overview of the options and indicate which ones may be good to use and when. This is the original size of ukulele. In fact, up until the 1920s it was the only size of ukulele out there. This one has a scale length of 13 to 14 inches. The total length will never extend beyond 21 inches. If you are looking for the most traditional sound when it comes to a ukulele, then this is the best option on the market. The sound may be a bit too quiet for some people, but if you are trying to provide yourself with a bit of solo backing to your singing, then the less-thick tone may be ideal. Many people opt for the soprano ukulele as their first instrument because it tends to be very cheap. However, it is important that you do not opt for the cheapest ukuleles around, mainly because they do not sound that good. It is better to spend a few extra dollars and have something that is going to last you a while. The major downside with the Soprano ukulele is that it is quite small. This means that the frets are going to be close together. If you have larger hands then you may find it difficult to play on it. This is why the main purchasers of this instrument will be children. They will eventually graduate to something a bit better. That being said, there are several top ukulele players who never really went beyond the soprano ukulele. For example; George Formby and Ohta-San. This is not really a ’size’ of ukulele as the pineapple ukulele can come in various different fret sizes and lengths. However, it is worth pointing out on this list. This type of ukulele was invented by Samuel Kamaka. As you have guessed, the shape of the ukulele is very similar to that of a pineapple. One of the major benefits is that there is not a waist on the body of the ukulele. This makes it a bit easier to hit the higher notes. This is the route you will want to go down if you tend to be playing at the upper end of the scale. Many fingerpickers love this option. This is not that popular as a ukulele, sadly. This is because it sits somewhere between the soprano ukulele and the tenor ukulele. The concert ukulele has a scale length of 15 to 16 inches. It has a total length of 23”. The major benefit of the concert ukulele over the soprano ukulele is that the sound of it is a bit ‘fuller’. In addition to this, the frets are a bit further apart which makes it easier to traverse the fretboard for those more technical pieces. However, most people will opt for the tenor ukulele if they are going to go down that route because it is bigger. The scale length of the tenor ukulele is 17 to 18”. The total length is 26”. This is probably the most popular type of ukulele on the market nowadays. What you must realize is that the sound of the ukulele has developed drastically over the years. While the soprano ukulele is very much the traditional sound, you do not hear it so much in performance pieces now. People have become more used to the fuller bass sound that the tenor ukulele offers. The fuller sound that this ukulele size offers means that it is easier to fit it into your performance pieces. You will find that it is used in most musical genres nowadays. Obviously, the major upside of the tenor ukulele is that the fretboard is larger. This means that it is easier to play chords and individual notes if you have bigger hands. Honestly, if you are an adult that is looking to get into the ukulele for the first time, then the tenor ukulele is the best route to go down. I would not really recommend that you go for the soprano ukulele unless you know that the sound is going to be something which is fantastic for you. This is the largest type of ukulele on the market. It has a scale length of 19 to 20 inches. The total length will be 30 inches. One of the unique things about this type of ukulele is the way that it is tuned. Unlike the soprano, concert and tenor ukuleles, this one will be tuned much closer to that of a guitar. This makes the transition between the two instruments that much easier. In fact, you can easily transpose many guitar songs onto the baritone with ease. That being said, the sound that this ukulele produces is going to be much thicker than any of the other options on this list. That is fine if you are not looking for the traditional ukulele sound. But if you are, then one of the other options will be better. The baritone ukulele seems to be reserved for those that play jazz at the moment. This is because it has larger frets. Anybody who has ever played jazz music will know that the chords that you need to pull off are incredibly complex. The more space you have to move about, the easier it is going to be for you. I would only ever recommend the baritone ukulele to somebody that is transitioning from the guitar. It makes the learning process that much easier for you. However, you may want to opt for one of the other ukulele types later on down the line. Ukulele bass is a mini version of an electro-acoustic bass guitar. It is smaller than a bass guitar but still pretty big compared to most ukuleles. There are two different types of this musical instrument: Bass ukulele and Contrabass ukulele. Bass ukuleles play the same open notes as a standard bass guitar (EADG), but one octave up. Bass ukuleles are slightly smaller than bass guitar -around 30″. There are also Contrabass ukuleles, which are around 32″ and also play the same notes (EADG), but at the same octave as a standard bass. There are versions that have frets and fretless versions as well. But the majority of bass ukulele players play fretted rather than a fretless bass ukulele. Nowadays, bass ukuleles are growing in popularity. If you’re considering purchasing a bass ukulele, it might be a good idea to buy an amp. You probably know that unplugged, they don’t produce a lot of sound. There are several types of electric ukulele. You can readmore about them here.